Building the Kingdom: What would Jesus write on Facebook? What would Jesus write on Facebook? 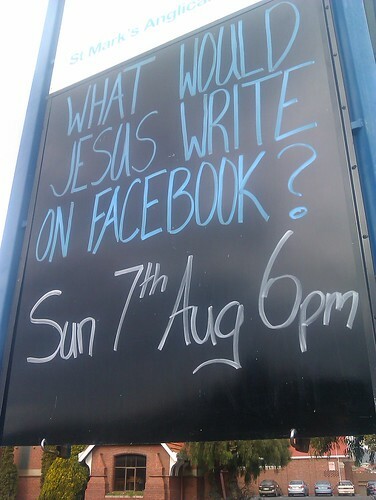 What would Jesus write on Facebook, a photo by james veltmeyer on Flickr. I'm preaching on this question, this Sunday 7th August at our 6pm service. It's been good to thinking about the topic and put my thinking into a sermon. The friend everyone wants to have and need is Jesus. I hope people will leave confirming their friend request from Jesus. I plan on recording it and putting on our church website. Pray that people will repent and trust in Jesus. I think Jesus would write a few enigmatic but challenging status updates about the kingdom and who He was. Then spend more time in person with his close friends teaching them about God ad how to pray and worship. :) cool idea.